Like the Allied Sherman Tanks, Tiger Tanks and other German armored units were a benefit and an impediment during the Battle of the Bulge. When American soldiers landed in France in June 1944 as part of the great Allied crusade to liberate Europe, they were well trained, fully equipped, and brimming with confidence. But, like their fathers two and a half decades earlier, they were in for a rude awakening at the hands of the seasoned, ruthless German Army. The GIs believed that, man for man, they were better soldiers than their foes and that they had more and better weapons. in combat, however, from the tangled Normandy hedgerows all the way to the gates of the Third Reich, the Americans found themselves learning bitter lessons and losing their innate naiveté. As their British and Canadian allies had already learned, the GIs and their officers soon came to respect the resolute fighting qualities of their enemy. they discovered, with considerable chagrin, that although they possessed a greater abundance of weapons, some of these were decidedly inferior to those of the Germans. The Wehrmacht’s machine guns and machine pistols had a higher rate of fire, its multiple-barrel mortars were more effective than the Allies’ single-tube weapons, and its self-propelled antitank guns were better. In terms of armor, the difference was daunting, with German tanks frequently outgunning and outmaneuvering the ubiquitous American medium Shermans and the British Army’s Churchills, Valentines, and Cromwells. 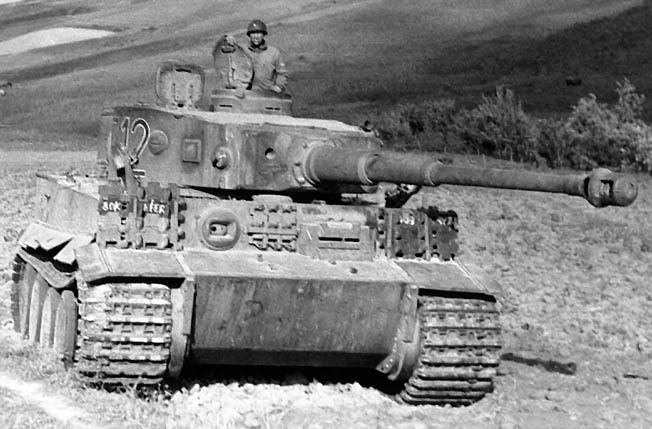 The third-ranking German tank was at least the equal of the Allies’ best tanks, and the formidable Tiger, mounting a high-velocity 88mm cannon, was superior to all armor in the European Theater of Operations. The most powerful tank of World War II, a single 67-ton Tiger II could hold up a dozen Sherman tanks, and often did. Known variously as the Tiger B, King Tiger, and Royal Tiger, the Tiger II carried a crew of five, had a 600-horsepower engine and a maximum speed of 21.74 miles an hour, and boasted a cruising range of 105.57 miles. It could knock out with ease any Allied tank at considerable range, and its armor was so thick (1.58 inches to 7.09 inches) that few British or American weapons could destroy it. Fortunately for the Allies, production of the Tiger II behemoths was constantly disrupted by Anglo-American bombing raids and shortages of raw materials, so only 489 of them had entered service by the time the war ended. The Tiger II served alongside the Tiger E in heavy tank battalions that were usually at the disposal of panzer corps commanders. Also carrying a crew of five, the Tiger E, sometimes referred to as the Tiger I, weighed 56 tons, had a top speed of 23 miles per hour, and mounted an 88mm L-56 cannon and two 7.92mm machine guns. A total of 1,350 Tiger I tanks were built. After debuting in the Leningrad sector of the Eastern Front in August 1942, Tiger I tanks continued to serve in Russia for the duration of the war, as well as in Tunisia, Sicily, Italy, and France. As was the case with the Tiger II, the major defects of the Tiger I were its bulk and weight, which inhibited it tactically, and its limited operational range. Rounds from the U.S. Army’s 57mm anti-tank gun had almost no effect on either the Germans’ 45-ton, 10-foot wide Panther tank or the slope-armored Tigers. The morale of many a U.S. infantryman was severely shaken when watching a Tiger destroy a whole transport column while a supporting Sherman’s 75mm shells bounced harmlessly off it. Yet, while the powerful German tanks came to be looked upon with great respect by Allied soldiers, their size and weight were disadvantages, as was made patently clear on the Eastern Front and in the Ardennes Forest in December 1944. When Field Marshal Gerd von Rundstedt’s three panzer armies stormed through the thin American defense lines in the snow-clad, fog-shrouded Ardennes early on Saturday, December 16, 1944, the Nazi juggernaut seemed unstoppable. Many U.S. units abandoned their weapons and vehicles and fled in disarray, while others stood valiantly until overwhelmed. However, the German thrust aimed at the strategic Meuse River and the vital Belgian port of Antwerp soon lost momentum as the retreating Americans reorganized, gathered strength, and began to hit back. The American response in the Bulge, buttressed with a swift and brilliant 90-degree maneuver by General George S. Patton Jr.’s Third Army and support at the Meuse River from British Army units, threw the enemy timetable off. Hampered by wider and heavier tanks, the Germans found themselves unable to move through the area as speedily as they had in the blitzkrieg of May 1940. Also contributing to the Germans’ failure to exploit their bulge rapidly was a disabling shortage of supplies, particularly fuel, and the limited mobility of their monstrous, gas-guzzling armor. 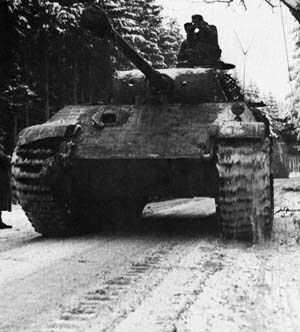 The few Tiger II tanks in the Ardennes were confined to a limited number of main roads and sparse, hard, frozen ground in the thickly forested, ravine-laced region. When any of the tanks broke down or ran out of fuel on the narrow roads, they blocked all other vehicles because the snow and ice-covered verges lay on top of mud into which tracks and wheels sank rapidly. Despite the initial shockwave that rendered the U.S. high command inert for two critical days, the enemy counteroffensive, blunted by epic defensive actions at St.-Vith, Clervaux, Bastogne, and other locations, fell behind schedule. The Germans failed to gain strong protection on their flanks or to secure the road network in Belgium and Luxembourg. The few good arteries would have to have been seized rapidly—both for German use and to prevent Allied reinforcements from rolling into the area. Four key junctions controlling the network—at St.-Vith, Malmedy, and Bastogne—would have to have been captured and held. To maintain their offensive timetable, the enemy columns needed to capture the four junctions on the first or second day. This did not happen, so the last major German attack of the war, Adolf Hitler’s final gamble, crumbled, enabling the British, U.S., and Canadian armies to resume their massive push to the Rhine. Tags Adolf Hitler, Allies, American, anti-tank gun, antitank gun, Antwerp, Ardennes, Ardennes forest, Axis, Bastogne, Battle of the Bulge, Belgium, Blitzkrieg, British, British Army, Canadian, cannon, Eastern Front, Europe, European Theater, France, general, Gerd von Rundstedt, German, Italy, Lenin, leningrad, Luxembourg, machine gun, Malmedy, Mark V, Meuse, Meuse River, Mortar, Nazi, Nazi Germany, Normandy, OSS, Panzer, Panzer Corps, Panzer V Panther, POW, Rhine River, Russia, Sherman Tank, Sicily, spars, Tanks, Tern, the battle of the bulge, the blitzkrieg, The Eastern Front, Third Reich, Tiger Tank, Troy, Tunis, Tunisia, US Army, weapons, wehrmacht, World War I.
I have studied World War ll history since 1973. I find this site to be accurate, well researched , and thus very interesting. I check the pertinent facts and seldom find a discrepancy as to established prior positions. Thanks for these historical treasures highlighting the heroic exploits of the gallant allied fighting men.America owes a tremendous debt of gratitude to every veteran. I am also impressed with this site and I forget it’s a wargaming site. As good as Military History mag. The Americans weren’t up to snuff on the equipment but they had figured out that without fuel it didn’t matter. Japan had similar problems. Good equipment but no gas! It is a shameful crime that the weak, petty, vindictive French could not solve the crime of murder of one of the most highly decorated, feared and respected officers in the Waffen-SS, perpetrated by French communists. It is just a shaeful, tragic death for such a brave soldier. “Such a brave soldier” who oversaw the murders of American prisoners of war. Had he been rightly hanged with the rest of his fellow Nazis, the French would not have needed to eliminate him. With the arrival of the 76mm high velocity gun with the HVAP (high velocity armor piercing) round on the M4 in 1944 the Sherman was on par with the Panther and capable of killing a Tiger plus the Sherman had the advantage of superior air cover, greater numbers, faster and nimbler maneuvering, more accurate optics, much more reliable … and so on. Furthermore, there were only three encounters between Tigers and Shermans, the Shermans won the first, the Tiger crew abandoned their tank in the second when it became trapped debris and in the third the Shermans caught the Tigers being loaded onto a train. At Arracourtt the outnumbered Shermans prevailed over the Panzer Vs. The 3rd division trounced the Panzers at Lorraine. By April 1945 the Germans only had 90 operational tanks on the western front, most of it being destroyed or abandoned at Normandy. As for bursting into flames, the Ronson Lighter angle, that also happened to the German tanks but fewer German crews survived to tell their stories. The Panzer was considered a fire trap because of its poor leaky fuel system. The name Nebelwerfers means smoke mortar they fire smoke shells or toxic gas shells, high-explosive shells and later became they made it a rocket artillery.